you will find a very elegant setting, an excellent service and a cuisine of the high level. The distance to the sea is only a short walk and the view of the bay is spectacular. CalaCuncheddi Hotel is located just a few meters from Li Cuncheddi beach in the granite promontory of Capo Ceraso, Northern Sardinia. It affords a unique and relaxing view that embraces both rocky and sandy coasts, framed by the typical lush vegetation. 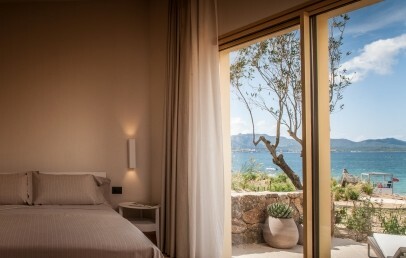 The area of 5 hectares that surrounds the Hotel is very close to the protected marine area of Tavolara – Punta Coda Cavallo and the distance to Olbia Airport is 12 km. Due to the particular isolated location of the hotel, we do recommend to rent a car. 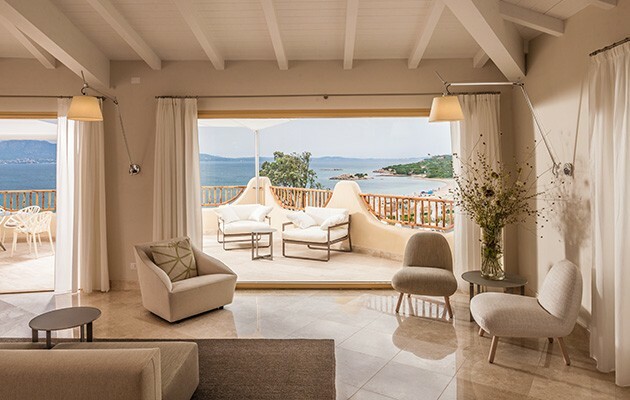 Totally rebuilt in the respect of the landscape, Hotel CalaCuncheddi is a 4-star superior hotel that guarantees high quality service and attention to every detail. The indoor and outdoor design is rigorously Made in Italy (Molteni & C, Gessi and Artemide) and throughout the hotel you can fell a sophisticated and warm atmosphere. Hotel CalaCuncheddi consists of 73 rooms and suites, swimming pool with solarium, Spa and fitness center, two restaurants and a Conference Centre. The rooms and suites of the hotel have a modern style and are equipped with air conditioning, television, Wi-Fi connection, minibar and safe, en-suite marble bathroom with Bulgari complimentary toiletries. The sandy beach Li Cuncheddi is only 20 meters from the hotel and for hotel guest sun beds and umbrellas are at disposal. For all beach lovers, who would like to discover other nice beaches, here some tips: Porto Istana Beach (5 km), Cala Brandinchi (20 km), Capriccioli (30 km) and a lot more. The Spa of the Hotel CalaCuncheddi is branded with "Gessi" and guaranteed by a professional staff. It offers a rich program of beauty, wellness and cromotherapy treatments and has a Turkish bath, a sauna, a whirlpool with waterfall and different treatment rooms. The fitness center has Technogym equipment and as well can be enjoyed outdoors activities, dipped in the beautiful nature that surrounds the hotel. The entry to the SPA is free of charge. At Hotel CalaCuncheddi you will find two restaurants: Asarena open for breakfast and Asumari open for lunch and dinner, both characterized by “0 km cuisine”. The gastronomic offer is either a menu selection of the hotel with starter, 1st course and main course, fruit and desserts or an à la carte menu with typical dishes (with surcharge). At disposal of the guests at CalaCuncheddi Hotel are complimentary: parking area, bikes, Wi-Fi internet connection. Other services are on request bookable: baby-sitting service, excursions and boat rental, hairdresser. To practice and enjoy different sea sport activities as sailing, surfing, windsurfing and kite classes, are possible in the vicinity. City tax – of € 2,50 per person/overnight, for a max. of 7 overnights, to be paid on-site. Exempt are children / youth up to the age of 16 years. The largest and most elegant accommodation of the hotel. The modern Suites are equipped with all comforts. The en-suite marble bathroom presents shower, make-up mirror, hairdryer, pool towel, bathrobe, slippers, Bvlgari complimentary toiletries. The Suites have a balcony or terrace with view on the bay and beach of “Li Cuncheddi”. Spacious Junior Suites equipped with all modern comforts. The en-suite marble bathroom presents tub or shower, make-up mirror, hairdryer, pool towel, bathrobe, slippers, Bvlgari complimentary toiletries. 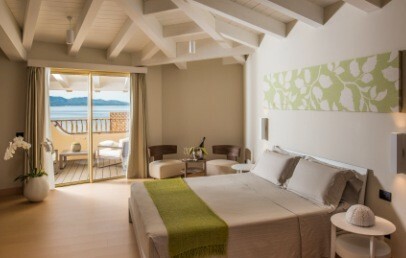 The Junior Suites have either a balcony or a terrace with sea view. 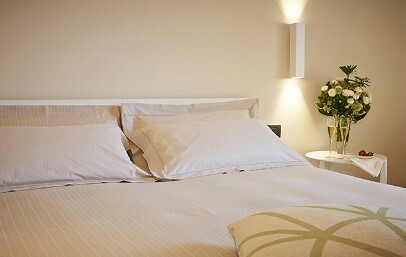 Cosy and large double rooms, equipped with all modern comforts. The en-suite marble bathroom presents shower, make-up mirror, hairdryer, pool towel, slippers, Bvlgari complimentary toiletries. The Superior Sea View rooms have either a balcony or patio with view on the beach “Li Cuncheddi”. Cosy double rooms, equipped with all modern comforts. 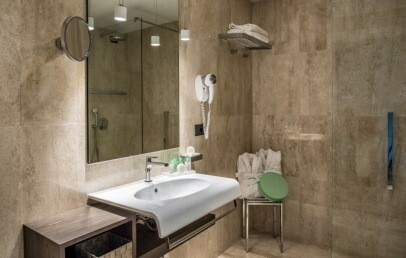 The en-suite marble bathroom presents shower, make-up mirror, hairdryer, pool towel, slippers, Bvlgari complimentary toiletries. The Standard rooms have a balcony or a small terrace with a view of the surrounding Mediterranean vegetation. Special Early Booking: book within April 30th 2019 and get a 20% discount on your stay (valid for stays between October 4th to 19th)! Special Early Booking: book within April 30th 2019 and get a 15% discount on your stay (valid for stays between May 17th and June 13th and between September 20th and October 3rd)! Special Early Booking: book within April 30th 2019 and get a 10% discount on your stay (valid for stays between June 14th and September 19th)!